On Tuesday December 11, 2012, Michigan, the birthplace of the nation's organized labor movement, became the country's 24th right-to-work state. This short excerpt from pages 81-83 of my 2002 book, Capitalism and Commerce, explains the propriety of right-to-work laws. Before these acts, an employer had the common law right to fight the unionization of his company. The employer could enter into “yellow dog contracts” with the employees in which the two parties would agree not to have a union—one reason for such contracts was the desire of the employees to avoid the loss of work and wages that would occur during strikes. Because these agreements were voluntary, they must have been to the mutual benefit of both parties. In addition, before the 1930s, the employer was free to attempt to persuade workers that unionization would not be to their benefit. Also, in his efforts to gain loyalty to his firm, the employer could refuse to hire workers who wanted to engage in union-related activity. The employer also had the common law right to establish a company union. Then, of course, the company always had the right to voluntarily agree to hire workers who belonged to a specific union. Unions were subject to the antitrust laws before Norris-La Guardia—not so thereafter. The National Labor Relations Act then destroyed the common law right of an employee to join a union of his own choosing or to represent himself. After such New Deal legislation, unions operated with the help of laws and court decisions to force employees to join them to gain a monopoly of particular jobs. Unions were free to use violence (picketing) against competing workers and intimidation against the employers through the strike. "By empowering labor unions the government did away with the old common law rules of contract, property, and tort that applied equally to all involved parties. They were replaced with a coercive legal framework designed to help labor union leaders attain their goals." By empowering labor unions the government did away with the old common law rules of contract, property, and tort that applied equally to all involved parties. They were replaced with a coercive legal framework designed to help labor union leaders attain their goals. As a result, common law courts were replaced by administrative tribunals (e.g., the National Labor Relations Board) which could be relied upon to implement pro-union policies. 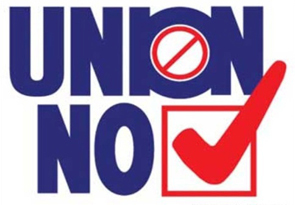 The government thus promoted unions by failing to apply laws of equal applicability to unions and employers alike, used its power to support unions, and allowed unions to use force in pursuit of their ends.